From Goodreads: The last thing Dawson Black expected was Bethany Williams. As a Luxen, an alien life form on Earth, human girls are…well, fun. But since the Luxen have to keep their true identities a secret, falling for one would be insane. I picked up this novella after reading Obsidian, because Shadows is the prequel and I was curious to know more about Dawson and Bethany’s ill-fated relationship. I have to say, had I known there was a prequel available before reading Obsidian, I would have read it first, but as things turned out, I ended up reading the first full novel prior to reading this prequel. That being said, I already knew the outcome going in, and yet, I almost feel like reading these stories backwards made me care even more about the characters than had I read them in the correct order. 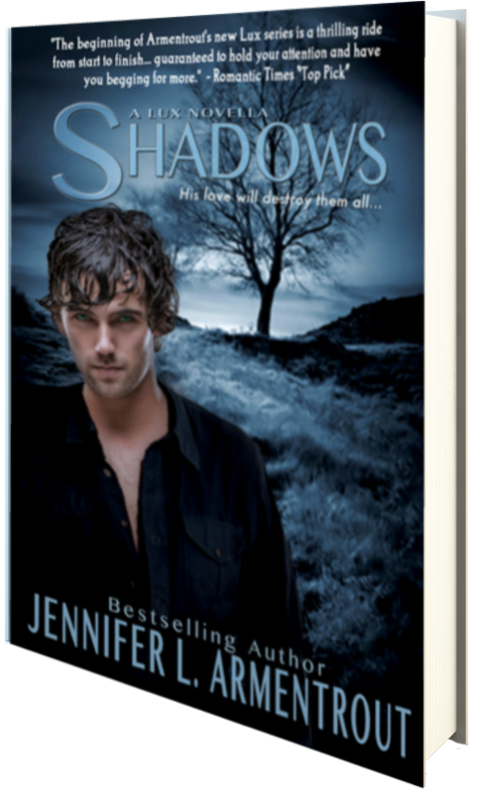 Would I recommend reading Shadows after Obsidian? Well, yes, I think I would, because even though I knew the ending going in, I had a healthy respect for all the characters and knew so much about them that I already loved the story before I even started reading. And just like Obsidian, Shadows is an extremely well written novella. Armentrout ties the novella and novel together seamlessly, giving the characters I loved, like Daemon and Dee face time, even though this isn’t their novella. She also gives readers more background information about the Thompson triplets, characters readers tentatively meet in Obsidian, but don’t obtain much information about them as they’re extremely minute. To be quite honest, it doesn’t really matter what order your read these two books in—Obsidian before Shadows, or Shadows before Obsidian… they’re both beautifully written and captivating, and you should read them both. Four stars.